by Adrian Ailes FHS. Coat of Arms no 117 Spring 1981. 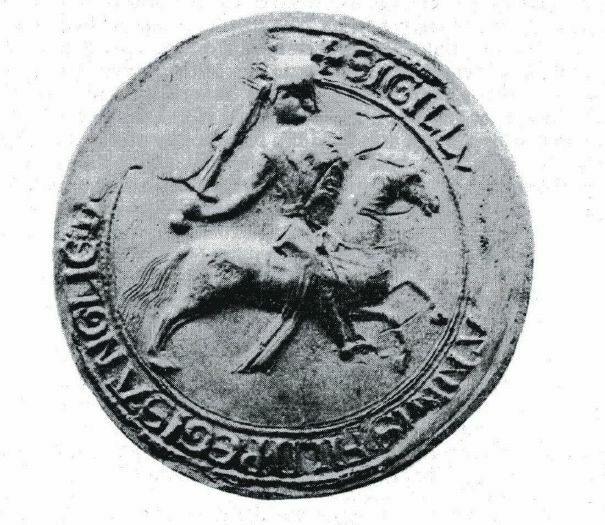 Between March 1185 and as late as October 1199, John, the youngest son of Henry II used an equestrian seal (fig. 1) of about three inches in diameter on which he is represented as a fully armed knight, galloping to the right, and carrying a convex shield charged with two lions passant. He wears a hauberk of mail under a cloth surcoat, and a coif surmounted by a round-topped nasal helmet which interrupts the legend between the words, HIB’NIE and + SIGILLVM. In his right hand he brandishes a sword. The horse wears an ornamental breast-band, saddle and stirrups; it is not caparisoned. The legend reads, + SIGILLVM IOHANNIS FILII REGIS ANGLIE DOMINIE HIB’NIE.1 John also used a counterseal (see fig. 5) which is the impression of an antique oval, intaglio gem, featuring a bust to the right which appears to be female. It bears the legend, + SECRETVM IOHANNIS. This gem was set in a ring which John himself wore. He seems to have used it after his accession (1199) when he also began to use a double-sided, great seal. For the historian and armorist then, John’s seal deserves close attention. Sadly this has not been forthcoming. 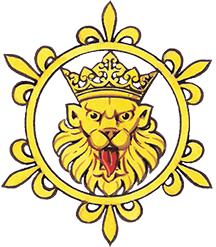 Authors, particularly in recent years, have consistently dated the seal to 1177 when John may have been recognised as Lord of Ireland.6 Furthermore, a number of writers have incorrectly described the lions on John’s shield as lions passant guardant, rather than simply lions passant. The reason for dating John’s seal to 1177 can be usefully summarised in Hugh Stanford London’s statement that, “the legend on the seal SIGILLVM IOHANNIS FILII REGIS ANGLIE DOMINI HIB’NIE, suggests that it was cut soon after 1177 when Henry II gave him Ireland”.8 Chronicle evidence that John was made “King of Ireland” in 1177 is however, confused.9 He was at that time a boy of only ten years, and of course was never made rex of Ireland or ever crowned as such. He was probably at the time simply recognised as the future Lord of Ireland. As a minor it is doubtful whether, before his coming of age, he would have been legally entitled to make grants in perpetuity for which he would have needed a seal. No acta of John as “Lord of Ireland” can be definitely dated to before 1185.10 Indeed, a charter of his father granted after May 1177 but before 16 January 1184 reveals the King still acting in his capacity as Lord of Ireland.11 John is referred to in this charter and is associated with the King in his Irish affairs, but he is not titled Dominus Hibernie. Moreover, it would seem improbable that as a boy of ten, and not yet dubbed a knight, he would have been using a personal seal on which he is represented as a fully armed knight bearing his own armorial device.12 It is true that his nephew, Arthur (b.1187), was using a personal seal when aged only twelve.13 Nevertheless, Arthur is depicted on this seal as a mere boy, mounted on horseback and carrying a sword but equipped without any defensive armour; his head is uncovered, he does not carry a shield, and instead of a mail hauberk he wears a simple cloth surcoat. Immediately after he was knighted however, he changed his seal for one on which he is depicted as a fully armed knight befitting his new status. The late Hugh Stanford London stated in his note on John’s seal as Lord of Ireland that, “in all the above charters [i.e. Harleian charters 83 A. 27; 83 A. 26; 43 C. 32; and Duchy of Lancs. 10/33] he is styled Count of Mortain, a county with which he was invested on 20 July 1189, shortly before his father’s death”.16 Henry in fact died on 6 July, and John was invested with the county by his brother, Richard, on 20 July.17 We know of no authentic document in which John is described as Count of Mortain before this date. In the Pipe Rolls of the English Exchequer he appears as “son of the King” in the Michaelmas account of 1188, and as “Count of Mortain” in the Michaelmas account of 1189. Whilst all the chronicle evidence suggests that, in granting Mortain to John, Richard was confirming a grant of Henry II, there is no record evidence to support this.18 We can safely assume therefore, that any acta granted by John as Count of Mortain can be dated to a period after 20 July 1189. It is ironical that Oswald Barron, a man so closely concerned with the revival of the mediaeval term, leopard, for a lion passant guardant, should blazon John’s lions passant as such.24 Barron would have agreed that there is no mediaeval authority for this. Authors from as far back as John Speed (1614) and J. Edmondson (1780) down to writers of this century have repeatedly moved the heads of John’s lions passant so that they now stare full-faced out of the shield.25 Sir John Anstis, Garter King of Arms (1715-44), drew John’s seal with two lions passant,26 but referred to them in his text as lions passant guardant.27 Whereas in the rudimentary stages of early heraldry the posture of a beast’s head was probably of not too much consequence we must be grateful to the late Hugh Stanford London for having finally put on record the exact nature of the lions on John’s seal as Lord of Ireland, Count of Mortain. In both his Art of Heraldry (1904) and Complete Guide to Heraldry (1909), A. C. Fox-Davies illustrates a shield (fig. 3) on which are displayed two lions passant guardant.28 These, he informs us, are the arms of John before his accession to the throne, taken from BL. Cotton manuscript Julius C. vii. This manuscript was the work of Nicholas Charles, Lancaster Herald (d.1613), and is perhaps most famous for its transcript of the Barons’ Letter to the Pope of 1301. On folio 190v there is an English translation of a charter granted by John at Clipston to the abbot and monks of Furness Abbey,29 alongside which there is an illustration of John’s seal from which Fox-Davies reproduced the shield. Charles’ drawing however, appears to be a somewhat inferior representation of the seal for it contains a number of notable errors.30 John is depicted with a kite-shaped shield (of which the complete face is visible) bearing two lions passant guardant (fig. 3). His head is covered with a metal coif; he is not wearing his nasal helmet. The horse’s hoofs, tail and the sword-point all incorrectly interrupt the border of the legend. But perhaps the most interesting detail is that of the legend itself, composed mainly of Roman capitals, SIGILLVM IOHANIS COM MORTONII FRIS REGIS ANGLI DNI HIBERNIÆ — an interesting attempt at the sort of legend John may well have chosen had he changed his seal on the accession of his brother in 1189. Fig. 4. 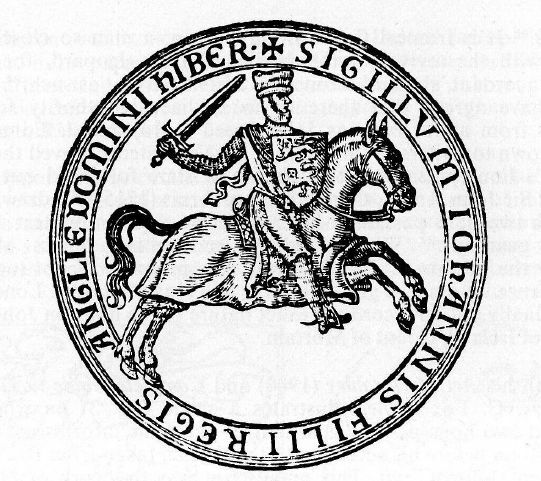 Speed's engraving of John's seal as Lord of Ireland. This, he informs us, “is at a charter granted to Dublin before John was King”. The only charter we know of that can fit this description is that of 1192 in which John granted rights and conferred certain liberties and free customs on his citizens of Dublin. This was granted in duplicate, and both charters are now in the hands of Dublin Corporation. Unfortunately only a fragment of the seal remains attached to the second charter, from which no distinguishing features can be recognised.32 That it would have been John’s conventional seal is, nevertheless, almost certain. Speed’s engraving stands in striking contrast to Francis Sandford’s (and Charles’) illustration of the same seal (compare figs. 4 and 5). Sandford, in his monumental, Genealogical History of the Kings and Queens of England (1677), refers to Speed’s engraving only to dismiss it. He notes that, “the seal is falsely depicted in Mr. Speed’s, Chronicle; for the lions in that are passant guardant and John’s horse is caparisoned, a thing not in use in the kingly family till the time of Edward I”.33 But despite this rejection, Speed’s version does have some surprisingly good redeeming qualities. Speed is not the only person to have misread John’s shield, and Charles too depicts him helmetless, wearing a mail coif. Whereas in Charles’ illustration the equestrian figure interrupts the inner circle of the legend at a number of points, Speed’s version is far closer to the original. 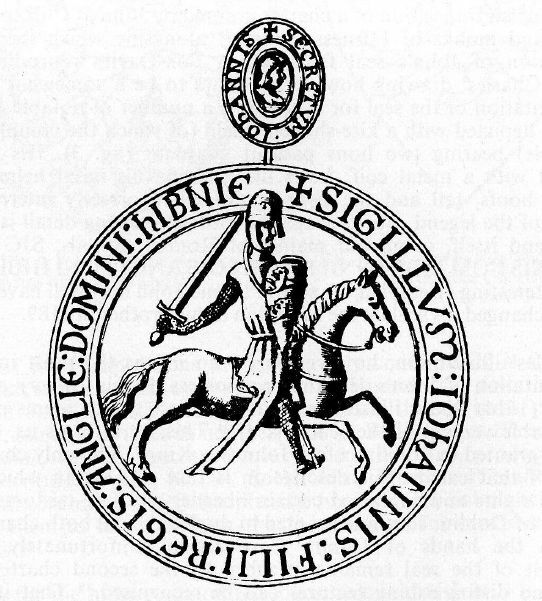 The legend is obviously more credible, and is made up of a healthy mixture of Roman and Lombardic initials in keeping with the style of the times.34 Furthermore, the engraver has depicted John quite correctly dressed in a cloth surcoat — John was the first English king to be so depicted on any of his seals. But what of the horse trappings? There can be little justification for this except a possibly poor or mutilated impression of the seal. Perhaps the hard impress of the large oval counterseal coming through from the underside of the seal and leaving its trace on the obverse may have been responsible for such a large influence on the design. Nevertheless, horse trappings were not unfamiliar apparel in John’s time. Whilst there is absolutely no evidence to suggest that Speed’s illustration is that of a second seal of John as Lord of Ireland, or that it possibly represents a forgery, we cannot now dismiss it as Sandford does by stating that horse trappings did not exist “in the kingly family till the time of Edward I”. The seal of William FitzEmpress, John’s uncle, clearly shows that as early as the 1150s members of the English royal house not only caparisoned their steeds, but also repeated their shield devices upon those caparisons.35 Speed (or perhaps his engraver) could hardly have been aware of this fact, and so by making what was to his near contemporary a glaringly apparent mistake, he was in fact quite in keeping with twelfth-century royal custom. Sadly, however, despite its merits, Speed’s engraving must remain the rather attractive expression of the lively, almost inspired, imagination of an artist making up for the deficiencies of an imperfect impression. Descriptions of the seal can be found in W. de G. Birch, Catalogue of Seals in the Department of Manuscripts in the British Museum, 6 vols (London, 1887-1900), vol. ii, no. 6323 [hereafter as BM]; C. H. Hunter Blair, “Catalogue of Seals in the Treasury of the Dean and Chapter of Durham”, Archaelogia Aeliana, 3rd series, vols vii-xvi (1911-19), vol. xiii, no. 3023 [hereafter as DS]; G. Demay, Inventaire des Sceaux de la Normandie (Paris, 1881), no. 48; Douët d’Arcq, Collection des Sceaux, 3 vols (Paris, 1863-68), vol. i, no. 900; Earldom of Gloucester Charters, ed. R. B. Patterson (Oxford, 1973), p. 25. A useful summary of the seal can be found in Margaret Jones, “Acta of John, Lord of Ireland and Count of Mortain with a study of his household” (unpublished M.A. thesis, University of Manchester, 1949), pp. 35-36: I am obliged to Professor J. C. Holt for having brought this work to my notice, and to Manchester University Library for permission to cite references from this thesis. C. H. Hunter Blair, “A Note upon Medieval Seals with Special Reference to those in Durham Treasury”, Archaelogia Aeliana, 3rd series, vol. xvii (1920), 244-313 (p. 265). For John’s secretum (not discussed here) see ibid., pp. 282-86; T. F. Tout, Chapters in the Administrative History of Medieval England, vol. v (Manchester, 1930), 133-34; and V. H. Galbraith, “The Literacy of Medieval English Kings” in Proceedings of the British Academy (1935), 201-38 (pp. 221-22). The seals of Henry (later Henry II) as Duke of Normandy, BM.6320, Henry the Young King, BM.79, and Richard as Duke of Aquitaine and Count of Poitou (F. Eygun, Sigillographie du Poitou (Poitiers, 1938), no. 6) are all non armorial. It should be noted also that whereas Richard I in October 1190 named his nephew, Arthur of Brittany to be his heir, both of Arthur’s seals which he later adopted are non armorial (Complete Peerage, vol. x, p. 799 note (f)). Most recently stated by J. H. and R. V. Pinches in The Royal Heraldry of England (London, 1974), p. 26; compare J. Woodward and G. Burnett, A Treatise on Heraldry, British and Foreign, 2 vols (Edinburgh and London, 1892), i, p. 210; and J. R. Planché, The Pursuivant of Arms, 3rd ed. (London, 1873), p. 100. Facsimiles of Early Charters from Northamptonshire Collections, ed. F. M. Stenton (Northants Record Society, vol. iv, 1930), 24-26. W. H. St. John Hope, 2nd ed. revd. by Anthony R. Wagner, A Grammar of English Heraldry (Cambridge, 1953), p. 1; H. S. London’s important account, “King John’s seal as Lord of Ireland”, The Antiquaries Journal, vol. xxxv (1955), p. 224; Rolls of Arms, Henry III, “The Matthew Paris shields”, ed. T. D. Tremlett, and other works (Harleian Society, vols 113/14, 1967), 3-86 (p. 16); G. Brault, Early Blazon (Oxford, 1972), p. 21; J. P. Brooke-Little, chapter on “Royal Heraldry” in Burke’s Guide to the Royal Family, ed. H. Montgomery-Massingberd (London, 1973), 94-115 (p. 94); W. J. Petchey, Armorial Bearings of the Sovereigns of England, 2nd ed. (London, 1977), p. 2; R. Marks and A. Payne, British Heraldry (British Museum: London, 1978), p. 102. That Henry II, as his “patron in knighthood” gave John a shield similar to his own has been discussed in detail by R. Viel ,”Les armories probables d’Henri II d’Angleterre”, Archivum Heraldicum, A° lxx (1956) Bulletin 2-3, pp. 19-23. London, Antiquaries Journal, xxxv (1955), p. 224. See Roger of Howden, Chronica, ed. W. S. Stubbs, 4 vols (Rolls Series, 1868-71), vol. ii, pp. 100, 133; and probably also by Howden, Gesta Regis Henrici Secundi Benedicti Abbatis, ed. W. S. Stubbs, 2 vols (Rolls Series, 1867), vol. i, p. 162; compare Giraldus Cambrensis, “Expugnatio Hibernica” in Opera, ed. J. S. Brewer, J. F. Dimock and G. F. Warner, 8 vols (Rolls Series, 1861-91), vol. v, p. 359. For a discussion of the evidence see W. L. Warren, Henry II (London, 1973), p. 204n.l. Jones, “Acta of John, Lord of Ireland and Count of Mortain”, pp. 26-28. Rotulorum Patentium et Clausarum Cancellariae Hiberniae Calendarium, (Irish Record Commission, 1828), vol. i, p. 1b; cited in Jones, p. 28. A great seal was cut in 1218 for his son, Henry III, then only eleven years old, which depicts him as a fully armed armigerous knight (Rotuli litteram clausarum in turri Londinensi asservati, ed. T. D. Hardy, 2 vols (Record Commission, 1833-34), vol. i, p. 381b). However, Henry had been knighted at his first coronation in 1216,and the seal, whilst in use in November 1218 (ibid., p. 381) was made with the proviso that no permanent grants could be made under it (Rotuli litteram patentium in turri Londinensi asservati, ed., Hardy (Record Commission, 1835), vol. i, p. 177). It was not until he was sixteen in 1223 that the king was permitted personal, though again limited, use of his great seal, and not until he was nineteen in 1227 when he declared himself to be of full age, that he was released from the limitations. See Kate Norgate, The Minority of Henry III (London, 1912), pp. 102-3. Both of Arthur’s seals (i) as Duke of Brittany, April 1199, and (ii) after Philip Augustus, King of France had knighted him at Gournay in July 1202 are catalogued in Douët d’Arcq, Collection des Sceaux, vol. i, nos. 532-33; see also Complete Peerage, vol. x, p. 799 note (f). Howden, Chronica, ii, p. 303; Radulfi de Diceto, Opera Historica, ed. W. Stubbs, 2 vols (Rolls Series, 1876), vol. ii, p. 34. For John’s imposing retinue which he took with him to Ireland see the introduction to Pipe Roll 31 Henry II (Pipe Roll Society, vol. xxiv, 1913), pp. xxiv-xxv; and W. L. Warren, “John in Ireland, 1185”, Essays presented to Michael Roberts, ed. John Bossy and Peter Jupp (Belfast, 1976), pp. 11-23 (p. 11). For John’s household before he became king see Jones, pp. 28-96. London, op. cit., p. 224. Howden, Gesta, ii, p. 73, but compare Chronica, iii, p. 6; L. Landon, The Itinerary of Richard I (Pipe Roll Society, new series, xiii, 1935), pp. 1-2 and 196. Chronicles of the Reigns of Stephen, Henry II and Richard I, ed. R. Howlett, 4 vols (Rolls Series, 1884-90), William of Newburgh, “Historia Rerum Anglicarum” in vol. i, p. 301, Richard of Devizes, “Chronicon” in vol. iii, p. 385; Howden, Gesta, ii, p. 73, and Chronica, ii, p. 6; see also Kate Norgate, John Lackland (London, 1902), pp. 24-25, and Jones, pp. 19-20. Birch in his BM Catalogue of Seals (vol. ii, pp, 337-338) incorrectly places Harl. Charters 83 A. 26; 83 A. 27; 43 C. 32 in the reign of Henry II. Francis Sandford in his Genealogical History of the Kings and Queens of England (London, 1677), p. 81 mentions three grants (two from the Chamber of the Duchy of Lancaster and one in Sir John Cotton’s Library) in which John is styled Count of Mortain. He adds that all three carry the same seal and belong to the reign of Henry II. It is difficult to see to which surviving charters he is referring. Duchy of Lancs. 10/33 is presumably one of those he saw, and this can definitely be placed in a period between 29 August 1189 and December 1189 or late 1190. No other original document of John, Count of Mortain (or his seal as such) exists in the Public Record Office. The Cotton charter to which he refers might be Cotton XVI. 43 (Aug. 1189-90), although this was drawn in facsimile in Sir Christopher Hatton’s, “Book of Seals” (c.1641-1642) without a seal. No other original charter of John as Count of Mortain can be traced in the pre-1731 lists of Cotton charters. John is styled as frater regis in the list of witnesses of a charter (Harl. 43 C. 28) granted by Richard just over a fortnight after his coronation. However, the term appears to be more descriptive than titulary as when it appears in the Pipe Roll for the Michaelmas session for 1189. John’s step-brother, Geoffrey, used a secretum inscribed, REGIS ANGLORVM FILII during both Richard’s reign and John’s reign (DS. 3221). John’s first wife, Isabel, Countess of Gloucester, continued to use her seal after their divorce, despite its anachronistic legend, with curious results (see Earldom of Gloucester Charters, ed. R. B. Patterson, pp. 24-25). DS.3025; also in C. H. Hunter Blair, “The Great Seals of Richard I”, Archaelogia Aeliana, 4th series, xxxi (1953), p. 97. N. de Wailly, Élements de Paléographie, 2 vols (Paris, 1838), vol. ii, p. 111. C. W. Scott-Giles, The Romance of Heraldry, revd. ed. (London, 1967), p. 48; compare T. R. Davies, “Edmund of Lancaster: Man of Many Arms”, The Coat of Arms, vol. x (1968 — 69), 260-75 (p. 260). 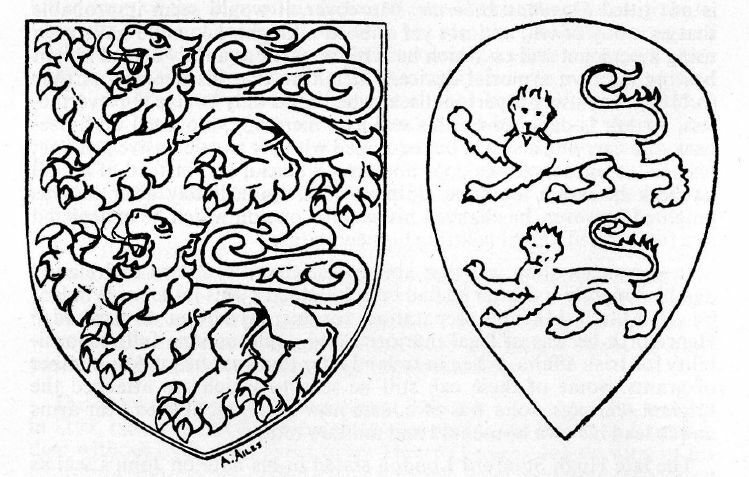 Mr. Scott-Giles correctly describes John’s lions as simply passant in his Looking at Heraldry (London, 1962), p. 76. Herald-painters of the early thirteenth century believed that lions must be rampant with the head in profile, and the leopard must be passant, with the head turned full-face (H. S. London, Royal Beasts (Heraldry Society, 1956), p. 14). See also H. S. London’s “Lion Guardant or Regardant”, Coat of Arms, vol. ii (1952-53), 194-95, and “Lion or Leopard ?”, ibid., 291-92. Oswald Barron, article on “Heraldry” in Encyclopaedia Britannica, 11th ed. (1910), 311-320 (pp. 312, 325). J. Speed, History of Great Britain, Under the Conquests of the Romans, Saxons, Normans and Danes (London, 1614), p. 498; J. Edmondson, Complete Body of Heraldry, 2 vols (London, 1780), vol. i, p. 183. Recent authors include Hope, op. cit., p. 1; and Petchey, op. cit., p. 2. “Aspilogia sive de iconibus scutariis gentilitiis commentarius”, 2 vols by Sir John Anstis with additions by Thomas Astle (now BL. Stowe MSS 665 and 666), vol ii, folio 21. Ibid., vol. i, folio 33. Fox-Davies, Art of Heraldry (London, 1904), p. 347; Complete Guide to Heraldry, revd. J. P. Brooke-Little (London, 1969), p. 377. In his text to the latter, Fox-Davies refers to John’s lions as passant (p. 135). This charter (which can be dated to between 29 August and the end of December 1189) is printed in Coucher Book of Furness Abbey: Printed from the original preserved in the P.R.O., Part II, ed. J. C. Atkinson (Chetham Society, new series, vol. xi, 1887), p. 419. Speed, op. cit., p. 498. The charter is calendered in Historic and Municipal Documents of Ireland, 1172-1320, ed. J. T. Gilbert (Rolls Series, 1870), p. 51. I am grateful to Mr. A. Duff of Dublin Corporation for information regarding the present state of the seals. Sandford, Genealogical History, p. 81. The abbreviated form HIBER does not, however, seem to have ever been used by John. In his text (p. 469) Speed described John’s “stile on his seale of Ireland” as “DOMINI HIBERNIAE”. Stenton, Early Northants Charters, pp. 24-26. This seal was known to Glover who drew a copy of it in his collection of charters (see Harley MS 245, fo. 153v; and The Heralds’ Commemorative Exhibition Catalogue, 1934, reprinted (London, 1970), p. 69).